UKIP has secured control of a �1.5m pot of EU funds by creating a new pan-European party, Newsnight has learned. The money is normally set aside for parties that want to promote European integration and the decision to seek the funding has split UKIP members. Some members believe it is is wrong for an aggressively Eurosceptic party to jump aboard the "EU gravy train". UKIP MEP Roger Helmer has defended the move and said the party needs to take a more pragmatic approach to funding. Mr Helmer, head of the party's delegation in Europe, added that this was a way of "liberating money" that would otherwise have gone to pro-European parties. Party members opposing the move complain that UKIP staged an internal referendum on the issue three years ago - and rejected the idea of accepting EU money in this way. It's not all bad news folks. Nigel Farage has defended a former Ukip parliamentary candidate who stood down after being recorded using derogatory terms about homosexuals and Chinese people. The Ukip leader said that Kerry Smith was "not suitable" to stand for election to Parliament for the party, but insisted that his comments were not made with malice. He described the Essex councillor as a "rough diamond" and criticised what he said was metropolitan snobbery against people form outside the capital using "colloquial" language. At this rate they're gong to run out of candidates. I'll only be content when they've run out of members. Come on you lot, make it happen. Prices start at a fiver per year. Ukip is advising its gaffe prone members to avoid joining Twitter and Facebook in a bid to stem the flow of controversies hitting the party in recent months. Ukip has expelled a councillor for what were described as "jaw-dropping" comments made in a TV interview. A party source told Kent Online that there was no hesitation in expelling Rozanne Duncan, councillor for Thanet, following the comments. It is not known exactly what her remarks were or what programme the interview was for. It has not yet been broadcast. A party spokesperson told Kent Online: "Ukip is expelling Cllr Rozanne Duncan under rule 15 of its constitution for bringing the party into disrepute. She has 28 days to appeal." They can't help themselves, can they? 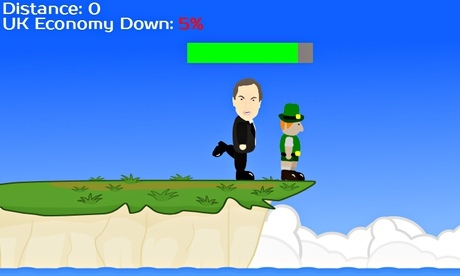 Farage claimed the game, developed by a group of sixth-formers from Canterbury Academy, was �risible and pathetic� and that it had �crossed the line�, despite saying he welcomed the opinions of young people. But the school�s principal, Phil Karnavas, has defended the app, which he says is a bit of fun to celebrate �brilliant, traditional British satire�. He said: �Never has a British political party offered themselves so easily to satire. �It�s a bit rich, bearing in mind some of the things the members of Ukip have said, for their leader to say they have crossed the line. The BBC is hinting that the latest UKIP banana is racist in nature, but results on google have been censored. Some results may have been removed under data protection law in Europe. Whilst I have no love of UKIP, they are being subjected to the same MSM propaganda onslaught that is waged against any and all voices that differ from the MSM line. And so, if people wish to cheer this kind of MSM campaign, those same people have no right to complain when it is waged against voices they do agree with. If a few more folk had treated Hitler and his cronies with derision, thirties Germany could have been a different place. Farage and his henchmen, like the BNP and EDL, need to be treated with the scorn that they so richly deserve. They represent a cancer which needs to be eradicated in this, the twenty first century.